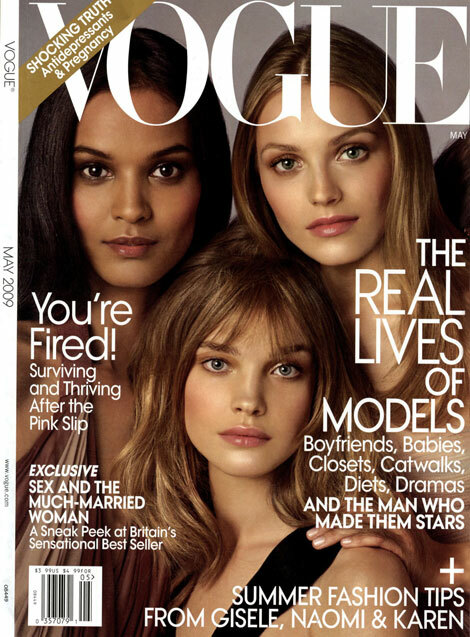 Speculations have been made but now the real cover is out: Vogue US does The Faces of the Moment in May 2009: (from left to right) Liya Kebede, Natalia Vodianova, Anna Jagodzinska, Isabeli Fontana, Lara Stone, Jourdan Dunn, Raquel Zimmermann, Caroline Trentini, Natasha Poly. I’d barely regonise the girls either! They almost look like shop window dolls. Photoshop has began to take away my joy in (fashion) photography/magazines and such…..
Well I guess its a showcase cover? Great observation, Ellington! Hope it goes on and on! I think it’s a way to recreate previous multi models covers. But in my perspective, this is really a bad composition. Great to see models on the cover of a fashion magazine. What else can Gwenyth, Jennifer, Angelina, Drew & co have to say? What is the big deal with this black person cover chant? I don’t see any white / asian people on the cover of ebony, essence etc. Africian Americian make up on 13% of the general population. What is disappointing about the cover are that they are all international models & NOT one american ~ that is the travisty. Vogue couldn’t find one beautiful working model from the good ole US.of A? I’ve always seen Vogue as a kind of international magazine. And its the same on all other fashion magazins and the catwalks so what’s the big deal? At least we can see now a difference between a celeb, movie and a fashion magazine. Fashion is international. By the way it’s interesting that Natalia Vodianova still, as a mother of three is still around. It’s years ago that I began to like her and Eugenia Volodina and Elise Combrez what has become of these ladies? The big deal Willow is as follows. “Ebony” and “Essence” are magazines that had to be created because for many years Black women and men are have been completely ignored by the rest of the world. They are stated as Black magazines. Is “Vogue” a White magazine or simply American? I think it aims to be as international and as cosmopolitan as it can be. Fashion is international and that should be reflected in a major fashion “bible”. Also if African Americans only make up 13 % of the population are you saying that they and other visible minorities have no right to be on the cover of “Vogue” or any other big name fashion monthly because there are not as many in comparison (who are you comparing anyway)? “There are specific magazines that are ‘geared’ to specific markets. Hence you have sports magazines, car magazines, Gay lifestyle magazines, Men’s magazines, home and decorating magazines, cooking/gourmet magazines, etc… . I have to inquire, are you White? If so the joy and pride that I as a Black woman feels on having 3 “Vogue” magazine covers in a row with women on them who resemble my melanin count may be lost on you. Its almost like the joy I felt when Barack Obama was elected President of the United States. To me this shows progress and change for the better that hopefully all nationalities and melanin counts will be represented and recognized. This can only be seen as a good thing and hopefully a sign of change to come for the inclusion of all. Then maybe we someday we will not have a need for “Ebony” and or Essence” as one of the only viable forums for Black people to be seen. Vogue’s origins are from a society paper from 1892. Therefore it is safe to bet that it was commenced to gear towards wealthy white women. 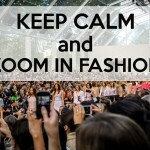 Subsequently it has evolved into an international fashion magazine for wealthy women (of all cultures). What I was trying to say is if Vogue has to reflect society then other magazines should follow suit. It doesn’t matter what colour I am it matters that one can not find fault with say one magazine that is aimed at a particular cultural group & not find the same issues with another one. It may be lost on you but people of Africian heritage are extremely visible in this world from B.O to Oprah to Darfur. The list goes on. Finally PS. Barack O is an ANGLO AFRICIAN AMERICAN! He is as Black as he is white. Thank you for thinking that you can educate me on Barack Obama, yes I know that he is half black and white as are many members of my family, but alas when the world views us they see as a Black (which is nothing to be ashamed of) and that is what he himself identifies himself as. When they do speak of him he is called the First African American president of the US not the first Anglo-African American president. Come on, you know this! Also it was not Black people who said that anyone with a drop of Black blood (a dubious term) was considered Black. This idea was created by White people. Yes I concur now that you have deemed to mention it, that Vogue may have started as that but it as EVOLVED to become an international reflection of world fashion not a small xenophobic ideal of just rich white women. It is not any longer aimed at just WASPS. Also you did not state that as your original argument that everyone else (ie) Essence should follow suit and reflect other cultures, you seemed to be taking umbrage with the fact that I and others were pleased that there were three Black women in a row on Vogue’s covers. If that was your intent and crux of your argument next time please state it in a clear and concise manner in the beginning, not as some after thought. You say it does not matter if you are White. I believe that I now have my answer. These things believe it or not Willow do affect our point of view (for good or bad) and where we are coming from. Its nice to pretend that these things do not matter, but they do. We are all a sum of many things. Education, economical, class and race. To act like these things cannot and do not matter is to make a grave mistake. The thing is to go forward, to learn from each other and to try to grow and not cause derision. This is something that I personally try to do everyday. And victories big like Barack Obama’s presidency and smaller victories like three Black women in a row on Vogue are things that I will always celebrate and take note of. You may not think it or them a big deal, but then maybe you have never really had to be faced with what it is like not to be “seen”. You obviously have no idea what so ever what I mean by the term to be ‘seen’. I have to say that it is very arrogant of you to think that I would not know anything of my culture. That would be like a man telling a woman that she has no idea what its really like to be a woman. Yes Dafur is in the news (for sad and dire reasons). Oprah Winfrey is a very powerful woman in the media, Barack Obama is now the president of the US. But do you realize that we as a heritage or visible minority are considered invisible? You mention two very powerful Black people and one very dire situation in Africa to say that Black people are “extremely visible”? Well let’s compare that to how many White people who are powerful and wealthy and how many mostly White countries are in the news not because of some horrid situation which is transpiring in Dafur. and “White like me” by Tim Wise. Read these if you wish to find out and have some understanding about what I am talking about. Great argument ~ I applaud you. If you don’t think that VOGUE is for WASPs then you are sadly mistaken. Take away any thought of race & it is aimed at a particular class of women & that ain’t you or me. But what we both aspire to be or have. As a woman (of certain class) I am invisible to many on a daily basis. Be invisible is not exclusive to the ethnic minorities. Africians are no longer an invisible group that is all I was trying to say within the western world. Of course there are more ‘white’ stories within those countries because they are the majority. You and I enjoy the same freedoms regardless of were we come from or what our influences are. That is the beauty of the 21st century. The shackles imposed are by your own thoughts and ideas ~ free yourself! Good luck to you. I will not be commenting to anything else. I have an inferiority complex and I want to be White? Wow how on earth did you arrive at that? That is the funniest thing that anyone has ever said to me either virtually or to my face. This is truly sad. Willow I leave you and your ideas and views alone because you are not open to any sensible discourse. Your arguments and conclusions and how you arrived at them are beyond the pale and they lack form and substance. You do not offer any sound rebuttal but deem it okay to make ridiculous assumptions about me and you insult me personally. I have only “attacked” your arguments and your statements in the form of a virtual debate, not you as a person. The fact that you chose as a recourse to attack me personally tells me a lot of how you base your thought process. I am not angry, but something tells me that you are, but then I don’t know you. Oh and just a tip Willow sarcasm is not a good form of intelligent discourse. Oh and I am not being sarcastic I honestly wish you well. Not to fuel more fire but what about white people and the tanning cult? Since the sun and the tanningbeds are considered dangerous for skin cancer and to speed up the ageing process a lot of white people have began to use the tanning sprays. Is that a kind inferiority complex too? Why do women wear wigs or get weaves? Why do women wear lipstick? Why do women lighten or darken their complexion? It is to do with wanting to be more attractive ~ so yes maybe we as women think we are lacking something. Your statements were both ignorant and callous. I too have to agree with Ellington. Your statements stem from never having experienced any form of discrimination, thus your ability to pretend that smply because it is well preached ALL of the shackles have been removed. If you do not believe me flip through one of those magazines at the supermarket one day. Look at the advertisements. Them featuring black models is not what is shocking, the fact I have never seen some of these versions is. If not for these magazines there would be no African America version of the advertisement. There would simply be the countlessly reproduced same picture of a white woman.